Measurement in serum and plasma b-Hydroxybutyrate (BHB) is produced along with acetoacetate and acetone during ketosis in carbohydrate deprivation (starvation, digestive disturbances, frequent vomiting), decreased carbohydrate utilization (diabetes mellitus), glycogen storage diseases, and alkalosis. Acetone usually accounts for only 2% of the total ketone bodies and its excreted in the urine or exhaled. Acetoacetate normally accounts for about 20% and could be spontaneously converted to acetone and CO2 or metabolized by into BHB, which accounts for the majority (78%), so its the best marker for diagnosis of hiper- or hipo- ketotic state or monitoring therapy for diabetic ketoacidosis. 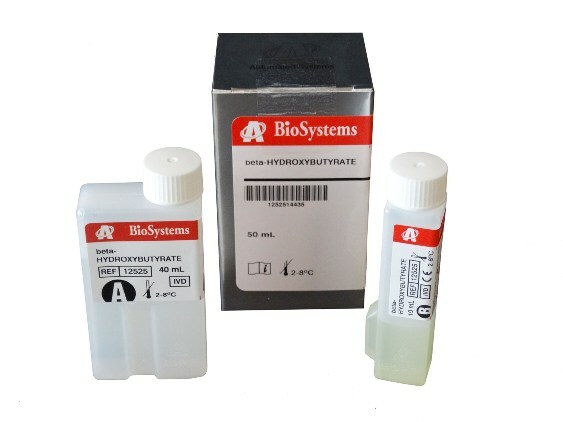 The BioSystems references 12525 and 21525 are available for automated analyzers A15/A25 and BA400 respectively. In order to do the calibration, its recommended to use Biochemistry Calibrator or the Biochemistry Calibrator (Human). To verify the measure procedures, its recommended to use BiochemistryControl Serum levels I and II, or Biochemistry Control Serum (Human) levels I and II.